Would you bother going to stores for shopping unless you have to? 30% of US-based respondents said NO if augmented reality made that possible. That’s why people love virtual try-ons — you can try products virtually and shop them at the comfort of your home. (Or you can boast of a cool selfie with top brand goods if you’re tight on the budget). Learn 15 best virtual try on apps that promise to rock in 2019. From ‘dark hoses’ that we have not yet heard about to world-famous apps that millions already know and love. These virtual try-on apps for iOS and Android are super fun, easy and surprisingly useful to use. If you’ve ever thought about wearing a tattoo, you remember how hard the decision comes. Will it look right? Will I look good with it? 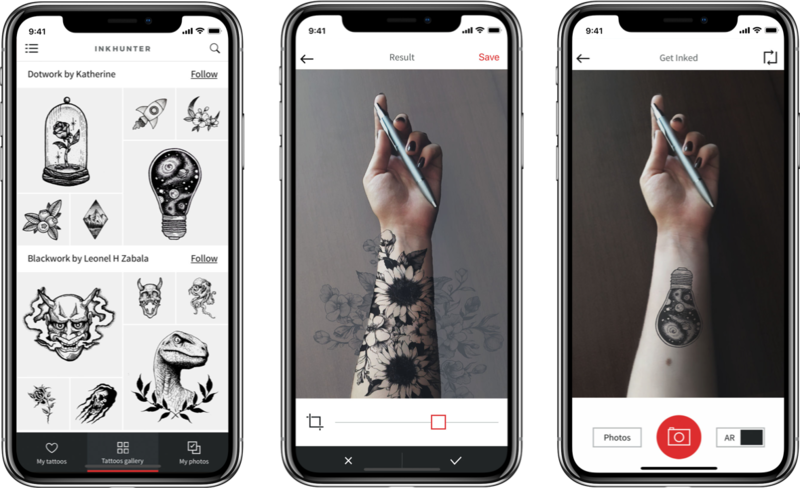 Inkhunter app provides the answers allowing you to try on any tattoo via augmented reality experience without risk and consequences. Not that we see the technology of virtual tattoo try-on a breakthrough that will push people into decorating themselves with lifetime body art. However, the app comes in handy for salons and body art fans. Or for everyone who wants his or her youngster dreams come true at least on a photo while keeping the real-life body “clean” as nature has made it. Ordering books or electronics online is commonplace to us. But glasses? No way. Items on photos or models wearing them look perfect, but will they suit us? Warby Parker app can give you a hint. This app provides real-time virtual glasses try-on experience featuring branded items that you can order right from the app. 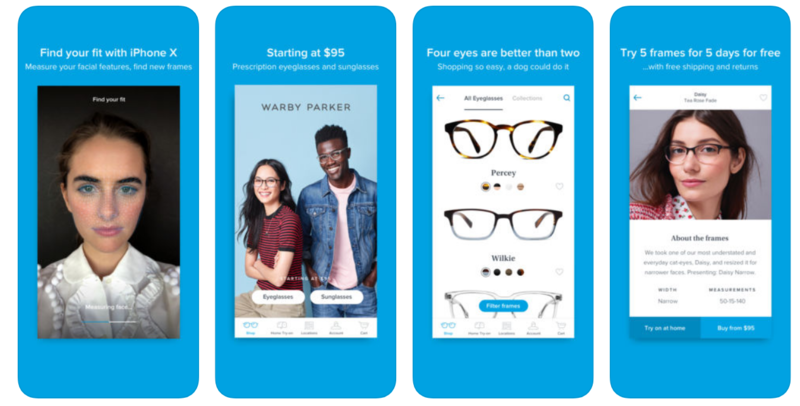 In case you need more glasses online from other brands, check Glasses.com app. It features hundreds of frames from Ray-Ban, Oakley, Burberry, Coach and others. The experience is not that smooth as with Warby Parker’s - you need to adjust your face position to make sure the glasses fit right. But the choice of frames to wear at home is truly diverse. There are companies who aimed to launch virtual haircuts and hair recolor app try-ons. Yet, only a few succeeded in bringing mature technology that goes far beyond manual selfie editing but provides real-time experience. Modiface is the one who did. Youcam apps are powered with Modiface’s real-time 3D facial tracking and face segmentation technology. It allows you to try on makeup, change the color of your hair. With their recent demo in SEC2019 of AR mirror, the hair recoloring experience is the example all brands should follow. 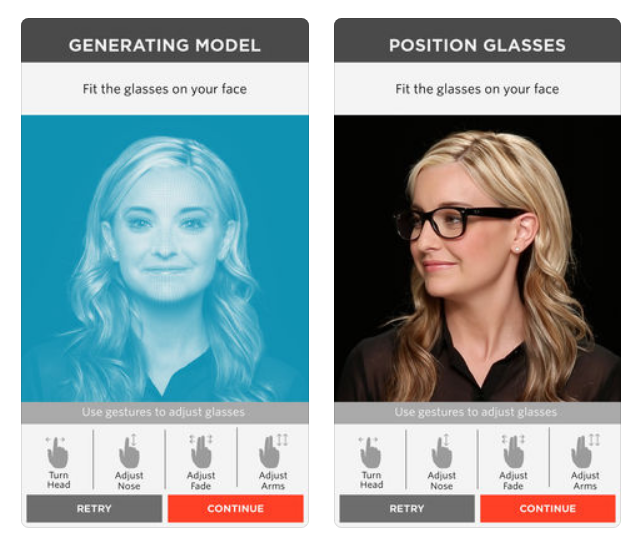 This year Sephora's virtual makeover app goes beyond lipsticks and lip glosses. It also expands to eyeshadows and eyeliners allowing you to augment the full-face makeup virtual try-on. You can virtually try on different looks and makeup outfits by simply swiping the filters. Or browse products based on category, brand, colour or favourites to see it live on your face. Virtual makeovers can’t be mentioned without L’Oreal since it's the #1 brand that transforms the beauty AR experience. Of all the makeup tools and apps powered with AR and AI, its Makeup Genius app beats all competitors in features and performance. L’Oreal also offers super diverse virtual try-on features via its site allowing consumers to try on hair colors and cosmetics before the purchase. Another makeup try on from Plum Perfect deserves special attention due to its fantastic personalization approach to makeup try-ons. The app analyzes your complexion and creates the perfect signature color for your lips, eyes, face, and hair. At a click of a button, you can get your unique makeup look and see products that suit your facial features and skin. See how necklaces look on you or match with your evening dress. The technology of neck segmentation overlays virtual jewelry on your selfie helping you to shop for the best-fit items. The concept is great but photo-only experience fails to unleash this virtual try-on experience. Lologem app is powered with face tracking and head-pose estimation to enable real-time virtual try-on experience for accessories. Girls can choose accessories from different brands and wear them in AR. Need a pair of earnings or a ring? CaratLane app can place a hundred on you. By recording a quick your selfie left-to-right video, you can try on a pair of virtual earnings. Getting married? No time to choose a wedding ring? Beaumade app can put on a dozen of gorgeous designer engagement rings right on your finger via mobile augmented reality experience. First nail makeup try-ons have appeared just 3 years ago and have been overlooked by mass media. Now the trend has gained a second wind in the virtual cosmetics world. Wanna Nails app allows trying on nail polish via augmented reality with your phone camera and buy the one you like. This app will also interest salons as customers may preview the result of nail art or pick the one that looks best on them. Clothing brands are actively looking into augmented reality to make online shopping easier for their consumers. 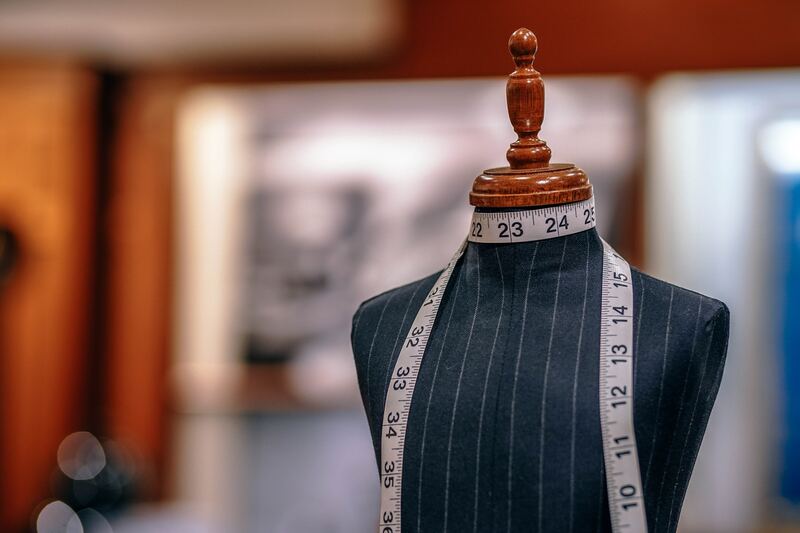 The Virtual Dressing Room app allows you to try on dresses, skirts, tops, shorts and accessories and create your best outfits for any occasion. All you need is your straight on full body photo with your arms down by your side. Buying shoes online can be painful. Who wants to deal with returns and improper size fitting? Virtual Fit Shoe app can help you match your size of the feet with inside shape of shoes, visualize them and find your perfect pair. #15. Your app iOS + Android? Enough about other brands’ apps. The idea behind all of them is that e-commerce is changing rapidly. Virtual try-on apps help brands overcome the pain points like product returns or customer engagement. And while most of the apps listed above are cool in their concept, they still fail to provide a sleek and convenient virtual try on experience. One that happens in real time, not via painful photo editing. Want to power your app with virtual try-on feature? Our technology lets users actually move with their face or hand to see the item from different angles and in real-time. No photo uploads or manual adjustments. Glasses, headwear, accessories and makeup overlay similar as Snapchat-like filter but look as real as on the shelf of your store.